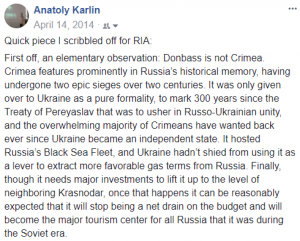 First off, an elementary observation: Donbass is not Crimea. Crimea features prominently in Russia’s historical memory, having undergone two epic sieges over two centuries. It was only given over to Ukraine as a pure formality, to mark 300 years since the Treaty of Pereyaslav that was to usher in Russo-Ukrainian unity, and the overwhelming majority of Crimeans have wanted back ever since Ukraine became an independent state. It hosted Russia’s Black Sea Fleet, and Ukraine hadn’t shied from using it as a lever to extract more favorable gas terms from Russia. Finally, though it needs major investments to lift it up to the level of neighboring Krasnodar, once that happens it can be reasonably expected that it will stop being a net drain on the budget and will become the major tourism center for all Russia that it was during the Soviet era. Donbass has no such significance in the Russian cultural imagination – one doubts that a majority of Russians can find Lugansk, let alone Sloviansk, on a map. It was always part of Ukraine, or to be more precise, Novorossiya – though separatism is not entirely foreign to it (recall the short-lived Donetsk–Krivoy Rog Soviet Republic). Though it is nominally rich, the coal mines – the mainstay of Donetsk’s economy – are antiquated, and unlikely to survive far into the future; and in any case, they are not much use shorn from the neighboring industrial powerhouses of Kharkov, Dnepropetrovsk, and Poltava, where separatist sentiment is much more subdued relative to the Donbass. Though the latter provinces might support a federal Ukraine, they will almost certainly be very much against joining Russia outright. And Russia itself doesn’t need the Donbass, especially by itself. 1) Any help or coordination that Russia provides to the separatist militias in Donbass and other cities in the east isn’t a prelude any unification, as in Crimea, but is meant to exert pressure on Kiev to agree to wide-ranging federalization. 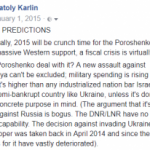 Ukraine was “lost” to the Eurasian Union when the Maidan overthrew Yanukovych in their coup. The plan now is to win at least half of it back. 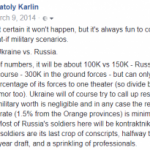 2) Short of truly massive bloodletting on the part of the Kiev regime – and I do not think it will come to that, though I have learned not to be surprised to the downside by those folks – the Russian Army will NOT intervene. The ball will be in Kiev’s court. 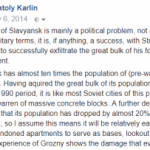 It can either leave the separatists in control, and they will proceed to carry out referendums that Russia could then exploit to cajole Kiev into federalization. Or it will – inevitably, violently – try to wipe out the “terrorists,” which will totally alienate eastern populations that are already very much unhappy with it. Given the mass defections to the separatist cause amongst the eastern siloviki, and the fact that Kiev can only truly rely upon Western Ukrainian units, the chances of success are low. If it were to pursue this route, it may well truly get a civil war on its hands, as historical Novorossiya rises up against the regime.